दरअसल 1950 से 1970 के बीच का समय हिंदी फिल्म संगीत का स्वर्णयुग कहलाता है. ये वो ज़माना था जब यो-यो हनी सिंह जैसे फूहड़ संगीतकारों ने भी स्तरीय संगीत दिया. इसका मुख्य कारण था संगीतमय वातावरण और फिल्मों में मार-पीट, भाषणबाज़ी और अश्लीलता की जगह संगीत को प्राथमिकता. इस युग में बने कई गाने आज दशकों बाद भी अपनी मिठास के कारण बजाये, सुने और सराहे जाते हैं. चाहे वो रेडियो-मिर्ची हो या स्टेज शो या ऑडिशन हो, अधिकतर इन्हीं गानों को चुना जाता है. इस संगीतमय वातावरण को बनाने में एक अत्यंत महत्वपूर्ण भूमिका निभायी शंकर जयकिशन ने. उस ज़माने के लोग ही जानते हैं कि जो लोकप्रियता और बुलन्दियाँ उन्होंने अपने अविस्मरणीय संगीत के बलबूते पर हासिल की वो ए.आर. रेहमान साहब ऑस्कर की टोकरी लाकर भी नहीं कर सके. अभी तक के इतिहास में शंकर जयकिशन शायद सबसे लोकप्रिय संगीतकार हैं, जिनका उस समय के बड़े बड़े नेताओं-अभिनेताओं से ज़्यादा रुतबा था. उनका संगीत आज भी प्रासंगिक है. इसका प्रमाण है – आप कोई भी दस पुराने गाने याद कीजिये, उसमें 2-3 शंकर-जयकिशन के निकल ही आयेंगे. 2 – 3 दिन में एक न एक बार आपका उनके गानों से पाला पड़ ही जाता है. राज कपूर, राजेंद्र कुमार और शम्मी कपूर के अधिकांश हिट गाने इन्हीं के बनाये हुए हैं. उसके अलावा “सौ साल पहले मुझे तुमसे प्यार था” या “ज़िन्दगी एक सफर है सुहाना” या “तू प्यार का सागर है” या “याद किया दिल ने कहाँ हो तुम”, इनके सदाबहार गानों की फेहरिस्त (लिस्ट) लम्बी है और काफी लम्बे समय तक चलती रही. ये गाने सुनने में जितने मीठे होते थे , गाने-बजने में उतने ही सुगम और आनंददायक. हमारा प्रयास यह है कि हमारे “सुरूर”-प्रेमी युवाओं को इससे अवगत कराया जाये और उन्हें ये समझाया जाये कि नाक से या गिटार पकड़कर गला दबाकर “तेरी ज़ुल्फ़ें …. तेरी बाहों में” रेंकने को ही संगीत नहीं कहते. डालडे का नकलीपन कभी खालिस घी के स्वाद को नहीं पछाड़ सकता. पंचम-दा और माफियार रेहमान जी के भक्तों द्वारा गुमराह युवाओं को ये समझाया जाये कि संगीत स्वर-वाद्यों से निकलता है, झाड़ियों को हिलाने से या पानी की आवाज़ से या लकड़ी को पीटने से नहीं. कम से कम हमारे युवा साथियों को पता तो चले कि मीठे पानी की झील क्या है और दलदल क्या है. इसलिए हमारा मिशन है शंकर जयकिशन के संगीत को अभी के लिए और भावी पीढ़ियों के लिए संजो कर रखना और उसका प्रचार करना और फलस्वरूप संगीतमय वातावरण का निर्माण करना. Contributed by Shri Sudarshan Talwar ji. Shankarsingh Ramsingh Raghuvanshi was born on October 25, 1922 in Punjab. 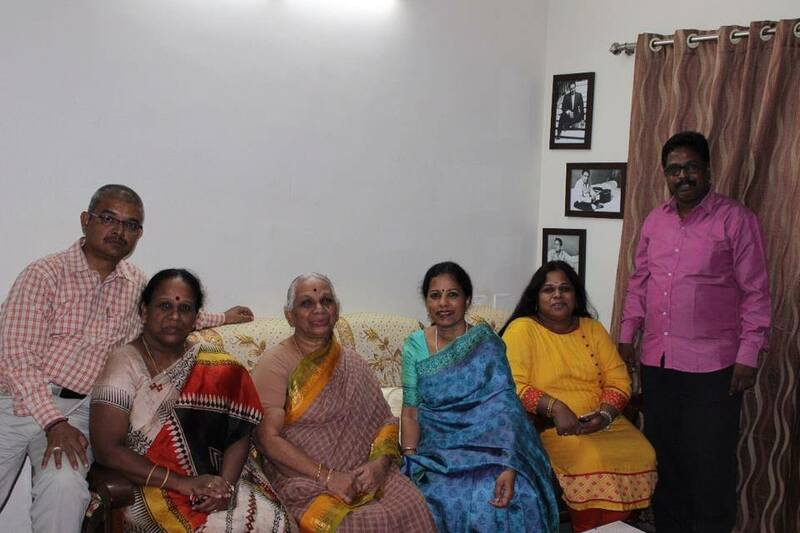 His father later moved to Andhra Pradesh and young Shanker was exposed to classical dance and music. He was both a trained wrestler and a dancer. He also showed a command over musical instruments and started playing the tabla at temples there. The family later moved to Mumbai, where he formally started learning the tabla under Baba Nasir Khansahib and composer Khawaja Khurshid Anwar. He later joined pioneering composers Husnlal Bhagatram as an assistant. A passion for theatre led him to join Prithiviraj Kapoor’s Prithvi theatre, where he befriended Raj Kapoor, leading to a lifetime of friendship and collaboration. On the other hand, Jaikishan Dayabhai Panchal was born on November 4, 1929, in Bansda, Gujarat. He started learning classical music from Sangeet Visharad Wadilalji and later from Prem Shankar Nayak. It’s said his father was a court musician of the ruler of Dharampur. The debonair musician actually wanted to be an actor, which was his prime motivation for moving to Mumbai. He started learning music under Vinayak Tambe and became a trained harmonium player. A chance conversation at the office of director Chandravadan Bhatt. acquainted them with each other’s love for music. Prithvi Theatre was searching for a harmonium player and Shankar took Jaikishan under his wings.Soon, both friends were providing music and even acting in plays produced by Prithvi. 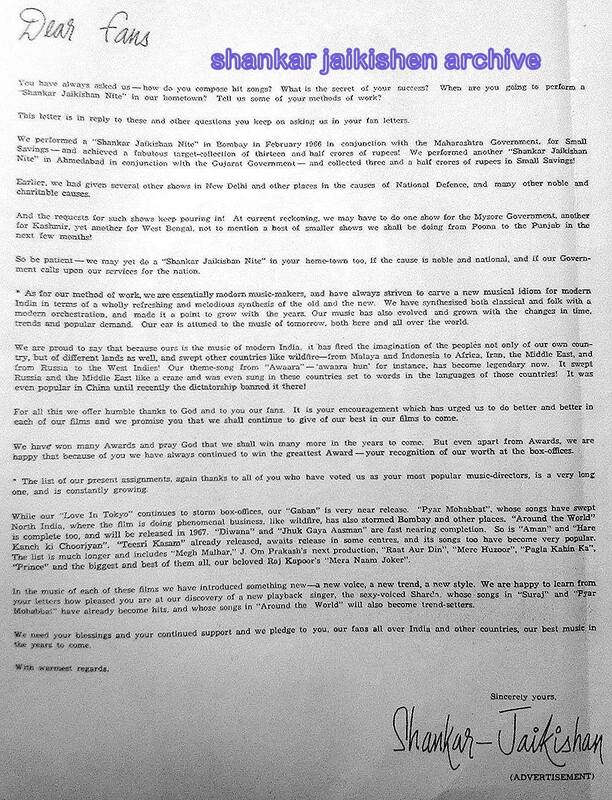 Raj Kapoor was launching his banner RK Films and made them assistants under Ram Ganguly in Aag (1948). Apparently, he caught Ram red-handed as he was about to sell one of his tunes for Raj’s next venture Barsaat (1949) to some other producer. Raj reportedly fired Ram and offered Shankar the music director’s baton. 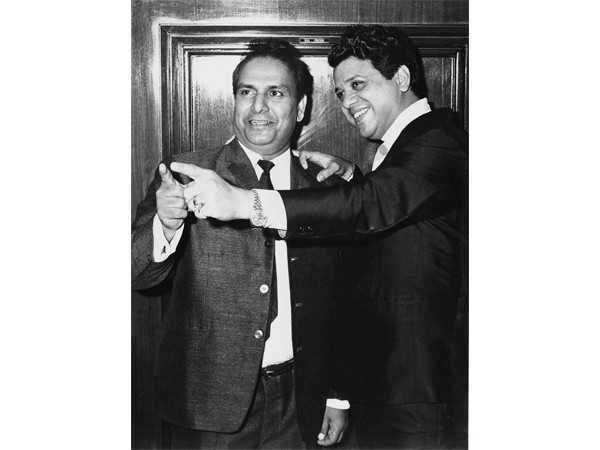 Shankar pleaded that he’d only join if his friend Jaikishan too was offered the same terms. Barsaat’s superhit music catapulted them as overnight sensations. Raj Kapoor may have helped in establishing them but it’s wrong to credit him for all their success. They shone even in non RK films like Daag, Basant Bahar, Amrapali, Asli Naqli, Arzoo, Dil Ek Mandir, Junglee, Love in Tokyo, An Evening in Paris. They enhanced the careers of Shammi Kapoor and Rajendra Kumar as well. They took risk with their first film Barsaat itself, taking a new voice, Lata Mangeshkar as the lead singer and making her sing for both the heroines, Nimmi and Nargis. Songs such as Jiya beqarar hai, Hawa mein udta jaaye or Mujhe kisi se pyar ho gaya are still remembered today. With Barsaat mein, they also started the trend of title songs. They had an established pattern for song composition. First would be a long instrumental flourish, where their 60 plus orchestra showcased its virtuosity. Then came the first stanza, where the individual instruments were heard accompanying the singer, then the interlude, where the singer caught his breath and so on to another grand flourish. They introduced the concept of counter melody, which is a sequence of notes being played counter to the main melody of the song, with the help of their arranger Sebastian D’Souza. Dattaram, their dholak player and rhythm arranger, introduced the Dattaram theka (a special rhythm for dholak), which is still being used today. They didn’t just stick to established singers but made sure they found the right voice for the mood. For instance, they used an unknown Subir Sen for Dil mera ek aas ka panchi from Aas Ka Panchi (1960), Suman Kalyanpur for Dil ek mandir hai from Dil Ek Mandir (1963), Manna Dey for Yeh raat bheegi bheegi, Chori Chori (1956), Asha Bhosle for Mud mudke na dekh from Shri 420 (1955), Mukesh (for Dilip Kumar) in Yeh mera diwanapan hai, Yahudi (1958) and made many more such off kilter choices. 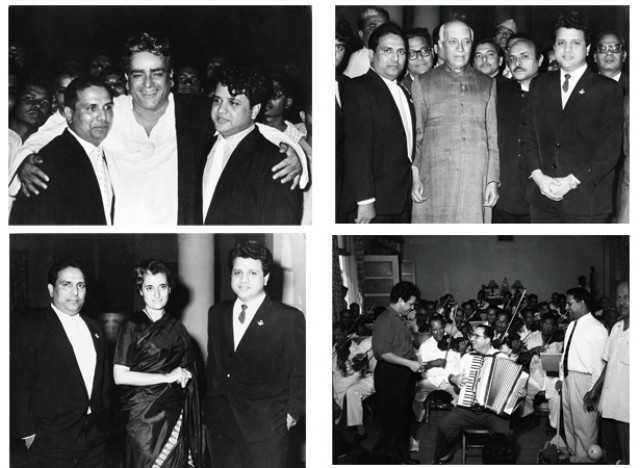 Jaikishan was the flamboyant, man-about-town who loved to dress in the best suits. He was the soul of the party and loved his scotch. Shankar was reticent, less boisterous and hence wasn’t the public face of the duo. He was said to have a liking for raag Bhairavi while Jaikishan liked to compose in raag Shivranjini. Shankar was said to prefer songs with dance moments while Jaikishan was said to prefer romantic numbers. The duo formed a team with different lyricists as well. 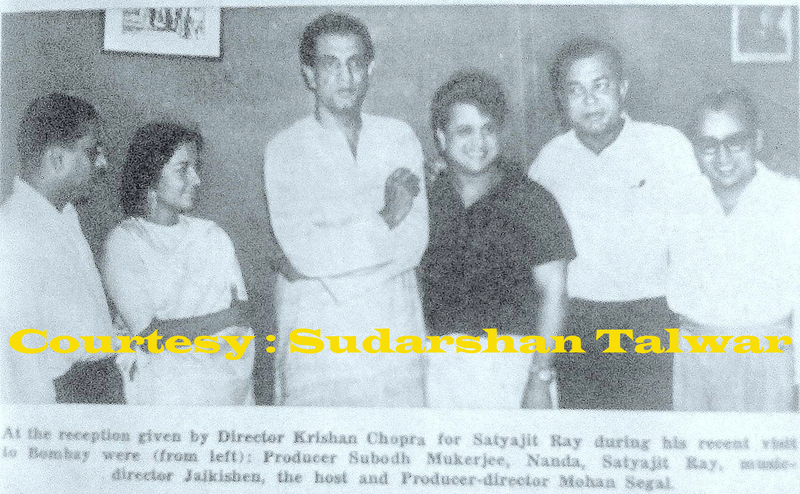 Shankar composed Shailendra’s songs and Jaikishan Hasrat Jaipuri’s. Jaikishan was known for his mastery over the background score. From their first film itself, one heard snatches of future compositions in the background score. For instance, the strains of O basanti pawan pagal from Jis Des Mein Ganga Behti Hai (1960) were first heard in the background score of Awara (1951). So, for all their differences, one can’t be sure which song was totally Shankar’s or Jaikishan’s. Thanks to abundance of work as also widening creative differences, they started composing separately from 1960 onwards but didn’t publically break the team. The popular radio programme, Binaca Geet Mala, was the litmus test for a song’s popularity. When Yeh mera prem patra padhkar from Sangam, composed by Jaikishan-Hasrat team got the top spot over Dost dost na raha from the same film, composed by Shankar-Shailendra team, their fragile friendship further deteriorated. People in Shankar’s camp made allegations of sabotage. Shankar’s insistence of using Sharda’s voice instead of Lata’s too came in the way. Things came to such a head that Jaikishan used to have separate recording sessions with Lata, sometimes even with a different set of musicians. Shailendra and Hasrat Jaipuri, their two lyricists became their common link at this point.